In last week’s conversation we felt like we hit a sweet spot…a bit of a nerve. You can check out the full recap (here). I’m guessing this is because many of us may be tired or burdened. Well of course we are…life is filled with heaviness and energy sucking activities. Well, Limit-Less is a 2 week series. A two sided coin. A two part conversation. There are limits…glass ceilings…lids…that others have placed on us, that we even put on ourselves, that inhibit us from doing what we were called and created to do…becoming who were called and created to be. Both Matthew 11 & Genesis 2, the texts we looked at last week, reflect a balance to this equation: Rest & Work. Sit & Serve. Fill-up & Spill out. Jesus’ words about his yoke, help us see this balance. After all, a yoke is a tool to work efficiently and effectively. And the creation story is a story of creative work, followed by holy and blessed rest. This is (or should be) our pattern: We work, we run, we influence, we produce, and then we pause, we sabbath, we rest…so we can get back to doing what God has called us to do. Jesus, in his ministry, showed us time and again, that when he retreated, he emerged ready to serve, to heal, to teach, to do the impossible and change the world. On this side of the Limit-Less coin…in this mode…in our work, in our calling, in our dreams…don’t let anyone or anything stop you from doing and achieving your good work. NOTHING WILL LIMIT or STOP me from doing what God has called me to do. RUN like you wanna win. Limits removed. Obstacles taken away. Lids blown off. Who put a lid on your calling? Who dropped an obstacle in your path? What happened that made you think you couldn’t or shouldn’t or wouldn’t? Maybe this OT story will help us here. – Israel had wanted a king like the other nations. A king that wasn’t God. They begged God for this. – Saul does not turn out to be good. He gets things wrong at every turn. Never realizing that leading God’s people is different than leading other nations. From there we reach chapter 16. How many times have we not done what we should, what God would have us do, something that could make a huge difference, because we were afraid? Don’t let fear stop you from doing what you know you should do. Limit #2 = I’m not ________ enough. 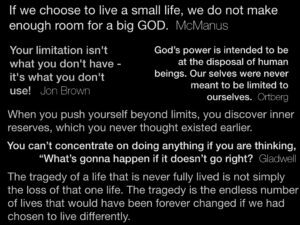 How many times have we not done what we should, what God would have us do, something that could make a huge difference, because we or someone else put a limit or lid on us? We will wait. We will hold on a min or more. Most people miss opportunities simply because they couldn’t wait for the moment to arrive. 13 So Samuel took the horn of oil and anointed him in the presence of his brothers, and from that day on the Spirit of the Lord came powerfully upon David. The beginnings of the story of King David is profound. To think that because of Age, Ability, Height, Time, he could’ve been overlooked. But God wouldn’t let that happen. To him…or to you. 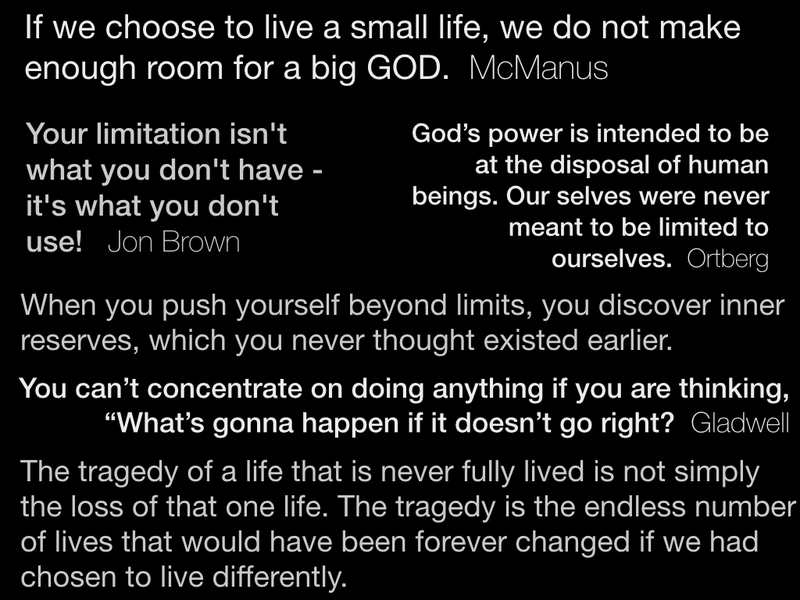 What is limiting you? What’s in your way? What have you allowed to block you? If we let every obstacle or limit control our destiny, we wouldn’t do or achieve anything. God does not put limits on us, he takes them off. God doesn’t put a lid on us, he removes it. God says, you can do this. You can achieve this. You are called to this. I’ll put my Spirit on you, and you can walk forward in confidence. Think about how this effects you. And think about how this effects our church community, and what we think God’s challenging us with here? keep obeying, and loving, and serving, and giving, and gathering, and scattering, etc. Will you balance last week’s Rest with this week’s Run? Stop with Go? Asleep with Awake? Limits with No-Limits? Boundaries with Boundless possibilities?